It was held at a training range of the State Emergencies Service in the Kyiv suburbs. 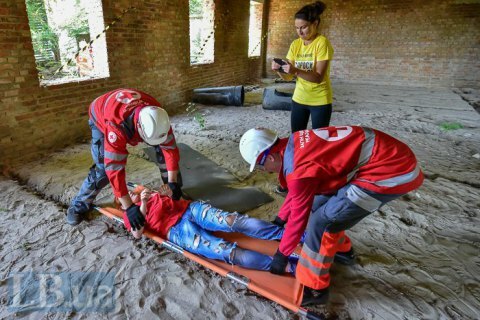 On 7 July, the Red Cross Society held a simulation training under the scenario of a "terrorist act in a shopping and entertainment centre" during which volunteers practised the evacuation of a big number of victims from the debris and first aid response. The drill took place at a training range of the Mobile Rescue Centre of the State Emergencies Service of Ukraine in Kyiv Region. To make it more realistic, makeup, a smoke machine and professional rescue equipment were used. The purpose of the training is to increase the capacity of Red Cross teams to respond to emergencies. Around 100 people took part in the exercise. The Red Cross Society holds annual meetings of rapid response teams, which have been in operation since 2013, to perfect volunteers' skills.